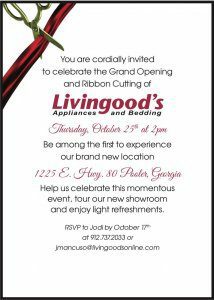 (SAVANNAH, GA) Livingood’s Appliances and Bedding will host a grand opening ceremony on Thursday, Oct. 25, at its new store, located at 1225 East U.S. Hwy 80 in Pooler, Ga. The event will begin with a ribbon cutting ceremony taking place at 2 p.m. The celebration will continue throughout the rest of the day, and guests are invited to enjoy light refreshments. Every visitor will be given a complimentary gift from the Livingood’s team and can enter to win a $3,000 Livingood’s gift certificate. Several local dignitaries and vendor representatives are scheduled to attend.